I remember when my eye first caught the gorgeous cover of Evermore. I was just getting into reading teen lit, and I was absolutely entranced by this series. My love faltered a bit near the middle, but re-surged once again by the end. 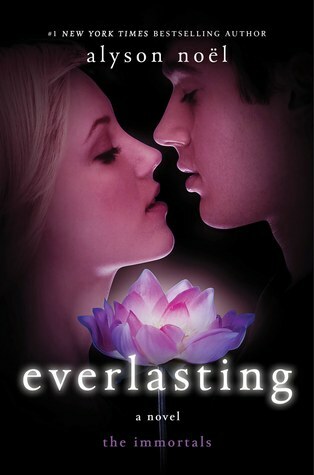 I waited awhile to read Everlasting but I wish I hadn't. This was a surprising, but fitting end to the series, and I enjoyed every bit of it. I was really shocked about the direction this novel took. If I expected the complete glamorization of immortality, I was sorely mistaken. And I kind of loved it. I mean, think about it. Would you really want to live forever? Would you want to have life almost pass you buy and just be stuck in place? I'm sure it would be awesome at first. But, forever is an extremely long time. And in reality, it would be more of a curse than a dream. And I kind of loved that Everlasting talked about that. I'm usually not a fan of karmic ideas, but I think it fit well with the themes and ideas of the series. Ever and Damen. Oh, I really do adore them. I've continued to read this series because I have such faith in their relationship. I mean, it's spanned centuries! But, they just seem to click together. They have their issues, both seperately and as a couple, but they also have this unbreakable bond and a willingness to make it work even through the hardships. Ever can sometimes be irritating, but in this last installement I was really proud of her determination. She knew what she had to do and was going to fight to make sure she fixed all the wrongs that had been made. I also liked seeing this uncertain side of Damen. Usually so sure and put together, getting to see a different Damen was an added bonus in this final installment. Together, they are a fantastic duo, and I'll miss reading about their adventures. My problem with book is ironic. Because, although I appreciated that this novel didn't follow the typical conventions I expected, I wasn't a huge fan of that way it did go. I think that's a personal perspective though, since it's the idea that bothered me. I loved the idea of questioning immortality, but not exactly the direction those questions took. Now, that sounds kind of complicated, and that's probably because I still feel muddled about it. The same things that made me enjoy the novel also detracted from it. I don't really like picture perfect, and I felt a lot of the novel was (or, it was implied that it would be) although, not in the way I expected. At the same time, after six books I wanted to see Ever and Damen be happy together. So, yeah. I was pretty conflicted about the whole thing. One thing I know for sure: I'm going to really miss Romy and Rayne. Overall, Everlasting was exactly the end that this series needed, even if I didn't see it coming. It was fun, engaging, and filled with passion. Things I love in a series, and things I'm glad to see in Everlasting. I'll miss the awesome duo, Summerland and all the amazing things that I have loved while reading the Evermore series! A great end, and a beautiful series. Great review. I thought this book was a very fitting ending for Ever and Damen and the series.